Today has been a year in coming. In early 2017 I determined that it was time to begin the process of retiring Africa and seeking a new guide dog from Guide Dogs for the Blind. Last February I contacted GDB Admissions and started the process. I completed the application process and sent off all paperwork. Although I have received seven dogs from GDB, each time I, or any returning student, goes back to school we go through the same application process. In one way this makes a lot of sense as the school needs to learn about me now, not just how I lived my life when I received my previous guide dog. I got Africa in November 2008. At that time my wife, Karen, and I lived in Novato, CA, seven miles north of the main Guide Dogs campus in San Rafael. Instead of going into a scheduled class I received in-home training from Todd Jurek, one of the long-lasting trainers and training supervisor at the school. Coincidentally, Todd also was Roselle’s trainer. Those of you who read this and who know me are aware that Roselle and I worked in Tower One of the World Trade Center and that we were in our office on the 78th floor on September 11. We got out and Roselle continued to work for six more years after the attacks. After submitting the application, now for my eighth guide dog, the waiting began. In April 2017, I believe, I was visited by the Southern California GDB field representative, Keith Tomlinson. Keith and I have known each other for many years. 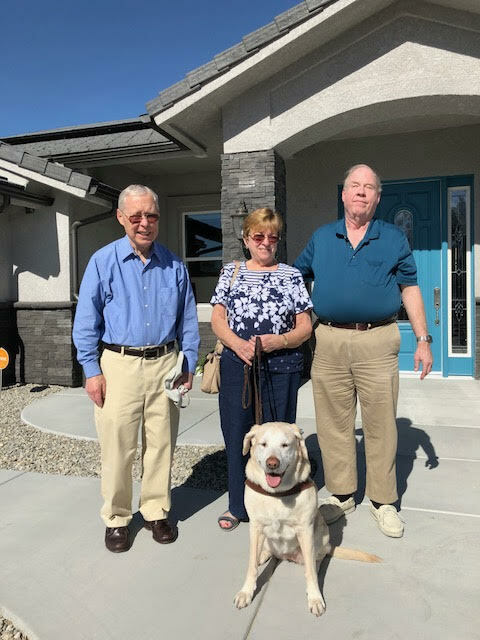 We did a “home interview” and we took a short walk for Keith to obtain information about my walking speed and to see that I was aware of how to travel effectively with a guide dog. I should explain here that in 2014 Karen and I left Novato and moved to Victorville, CA in the Southern part of California. After the home interview, more waiting. Finally, in June I received the notification that I was accepted into the program. I had already discussed with the admissions staff possible class dates. When we began talking in February I learned that there was not much chance of doing in-home training. My options were to travel to San Rafael or to the Northern GDB campus in Boring, Oregon. The first San Rafael class with space would be in June 2018. The first available class in Oregon that could accommodate me would open on February 11, 2018. So, I stated to Admissions that I would take the Oregon class. So, here we are. Over the past few months I have been reviewing training materials sent to me by the school. In some ways training is still the same as when I received my first guide, Squire, in June 1964. At the same time, many things have changed. I will discuss some of the training over the next two weeks as I learn with my new guide, whoever that is. You see, we do not know in advance what dog we will be receiving. By the time we arrive in class the training staff have a good idea of what dog they wish to assign to each student. However, the final decision is not made until we arrive and meet and work with the staff on Monday morning. I should say that one-way training is different today is that the student/faculty ratio is smaller. In Oregon the class consists of six people with two students per instructor. In days gone by I remember classes of 12 and 13 students with a ratio of four students to one trainer. With the new class sizes students get more individual time and better personalized instruction. Dog training has also improved as each dog gets to spend more time working and training with an instructor. The time it takes to train a guide has dropped from approximately six months to two to three months. There is more to it than just more quality time between dog and trainer, but we shall get to that in later articles. For now, I am on my way. I am writing this in Phoenix as I wait to board my flight to Portland, Oregon. It is getting exciting. It is now 7:45PM on February 11. I made it to Portland Airport after only a brief delay on the ground. By 2PM I met my volunteer driver, Jim, and we took off for the half hour trip to the Boring, Oregon campus. Another student also arrived at the same time, so Jim transported two of us to campus. We arrived closer to 3PM and we were met by Wayne and Sarah, two long-time Guide Dogs volunteers I had met several years ago. It was good to see them. At 3:30PM five of the six students had arrived on campus. We were given an orientation to the facilities. The most dramatic change for me is that now each student has their own room. It used to be that two students shared a room. There were enough suggestions on the part of students concerning more privacy that each of the six rooms on campus were converted to single rooms. While this may lead to a few less students graduating over the course of a year since all classes are now 2-week sessions roughly 12 students will go through the Boring campus every four weeks. For the most part the dorm is the same as I remember it. We saw the meeting rooms, the dining room, and even a well-equipped exercise facility. There is no doubt that every effort has been made to keep students comfortable while in class. At 5PM we hustled into the dining room for dinner. There are now more food choices than before. I guess this too is a response to people desiring a more diverse menu. The food tastes as good as I remember from the past except now there is more of it. I did refuse the Chocolate Brownie Pie. This has been a long article. I did want you to get a flavor of the first day and decided to give it to you all at once. Tomorrow morning, we meet with instructors at 8:30AM to begin training. Of course, this is after a sumptuous breakfast with lots of choices. Training Monday morning consists of some time walking with our trainers, so they can see our walking paces and how we pull on the harness while traveling. More on that tomorrow. This entry was posted in New Guide Dog Training by Mike Hingson. Bookmark the permalink. What was the name of the guide dog I met in Palmdale when I visited you and your father there? Good luck with the new dog. So good to read this. I have been a volunteer puppy raiser for Summit Assistance Dogs, and participated in their team training a few times. Nice to read how other organizations do team training. Best of luck with your new partner. Read your book with tears in my eyes. What these magnificent dogs do for us.